Beautiful Social gives students, like us, the opportunity to interact and work with local organizations doing good in our community. Our group has had the pleasure of working with LUCY Outreach, also known as Lifting Up Camden’s Youth, an organization dedicated to creating a safe environment and different programming for youth ages 7-25. No one in our group had been to LUCY before taking this class, however many of us had heard about it through weekly service or service learning classes. As we are about halfway through the semester, we decided to take time to reflect on our feelings/experiences before and after our visit to LUCY. How did we feel before going to LUCY? Most of us had heard of LUCY before joining Beautiful Social, but we were not really familiar with what they did as an organization. We were excited to learn more about them and actually see what they do in action. Given the fact that Saint Joseph's already interacted so much with LUCY, we weren’t too nervous since that indicated that both parties were happy with the relationship that had already been developed. Abbey, our Beautiful Social fellow, had mentioned “youth nights” and other programs. We assumed youth nights would be a series of games and things that participants could look forward to during the week. As for the youth, we were unsure about how they would react to our project. Since we were coming into their home, we were wondering how they would feel about us filming and interviewing them. Even so, we were excited to go and meet the people we would be working with this semester. How did we feel after going to LUCY? 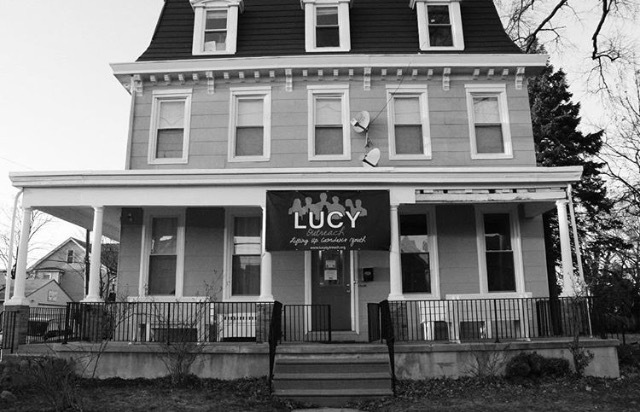 After visiting LUCY, we developed a new appreciation for the program and a true connection to this project. When we visited, they were holding their Multicultural Night. Yoresmi, the staff member leading it had videos prepared that all weaved together. She also divided us, SJU students included, into a couple of groups to learn about and present information on a certain country. They performed dances, learned about different foods, and practiced counting in other languages. We thought it was really cool that LUCY brought in educational components to their programs. Since the organization serves youth, they need to make sure that the youth participants are engaged. It can be really a hard balance to strike when you involve components that are openly educational. LUCY does this flawlessly. Meeting the youth was so much fun, they welcomed us in openly and were excited to have us participate in the activities. It also made us happy to see how open they were to our project., They were excited to give us suggestions and tell us what they loved about LUCY. These kids chose to come because they really enjoy LUCY and the environment that has been created by each of them. Seeing students excited about the things they are learning and excited to a part of the LUCY family gives us a stronger sense of pride being community partners with LUCY Outreach.